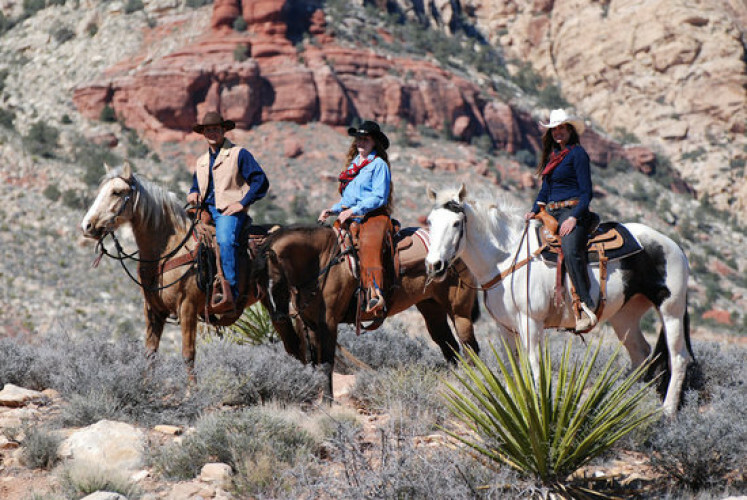 This horseback tour includes gorgeous Southwest views and a Western-style meal. After your one-hour horseback trail ride, visit a cowboy town and a petting zoo. The Ol’ Spanish Trail adventure begins with a pick-up from your hotel, and after a short ride to the ranch you will be greeted with a warm welcome by our ranch hands. They’ll be ready to pack your horse and saddle you up for a beautiful excursion into the Wild West. You will ride on the same dusty trails that were once ridden by some of the most infamous outlaws of the American West, including the Ol’ Spanish Trail. Once stretching from Santa Fe to Pueblo de Los Angeles, this single stretch reached its heyday in the mid 1800’s. Then you’ll return to the ranch just in time to feast on an authentic cowboy lunch. After your trail ride and meal we will take you to our cowboy town, and petting zoo. Helmets are available for use by all riders if requested and are free to use on the ride. All children 12 years old and under will be required to wear a helmet on this ride. Children must be 6 years and older.